Godwin’s law is that the longer an online debate gets, the more likely it is that someone will make an analogy to Hitler. One corollary to the law is that the person who makes the comparison loses the argument. A reductio ad Hitlerum is a rhetorical device altogether common in internet dialogue used to show someone how they are evil just like Hitler. Adolf Hitler is, of course, one of the few human beings that people can nearly universally agree is the embodiment of pure evil. But if Hitler was the embodiment of pure evil and the German people put him into power, how did he either trick them or force them to make him the supreme ruler of their nature? Or, more sinisterly, was it that the German people were somehow an evil people themselves who saw Hitler as the embodiment of their nation. The third option is helpful wartime propaganda, but unlikely to be convincing in the presence of real, live Germans who may think differently, but who are pretty clearly not the embodiment of evil. This leaves the first two as possible options. In the late 50’s, journalist Milton Mayer set out to figure out how Germany was led to elect Hitler—even to cheer him on—despite the evil that he embodied. Mayer, an American of German descent and a Jew, went to Germany to spend time with common men in a small town in Germany to figure out how they were duped. 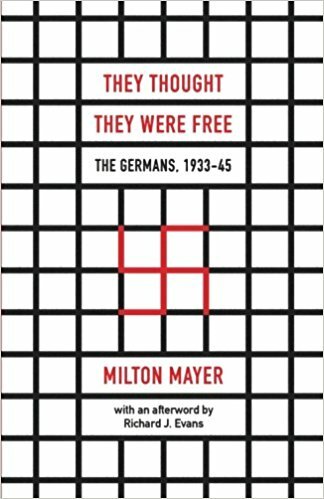 The result of Mayer’s journalistic efforts is contained in the book, They Thought They Were Free: The Germans, 1933-45. The book was originally published in 1955 but was republished in 2017 by the University of Chicago Press. The volume’s republication is timely as Europe and the U.S. wrestle with the rise of populism in the face of economic difficulty and political destabilization. In some ways, we are living in a period very similar, which means that if we are to avoid (or overcome) the great evil of our age, we must be prepared to learn the lessons from history. The book is a collection of interviews. They have obviously been edited to focus the reader on what Mayer himself saw, but the portraits he paints of the ten Nazi men that he befriended and interview do not bear the marks of caricature. Though he had every reason to be repulsed by these people who had supported the regime whose crimes are now the most readily useful hyperbole, Mayer presents his subjects sympathetically and, we may presume, fairly. If what he depicts is really true, then we have good cause for concern. It becomes clear throughout the book that none of the people being interviewed consider themselves bad people—their loss in World War II was an unfortunate reality they were coping with, but even the public discovery of the mass murders in the concentration camps did not convince these men they were culpable for such great evil. Though the world may have viewed Germany broadly as somehow complicit in the extermination of the Jews, homosexuals, and other “unfit” populations, these men clearly do not believe they are criminals. As the interviews explore the mindset of these Germans leading up to and during WWII, it becomes clear that these people—not to say all Germans—actively supported Hitler’s social program. Hitler solved unemployment, bringing relatively prosperity to a large portion of the population. He helped bring them out of the depths of depression and give them a sense of national pride, even after the stinging defeat and economic reprisals of the Great War. A rising stock market, so to speak, was a bigger concern than the dispossession of a small minority of the population. The Nazis were unquestionably anti-Semitic. That was in the DNA of the National Socialist party, very clearly written in Hitler’s book, Mein Kampf. At first, when the vitriol in Hitler’s book might have been more striking, it was apparently not commonly read. To be fair, how many Americans have really read The Art of the Deal or The Audacity of Hope? Even if those books had alarming theories in them, it would be altogether easy to minimize their implications or ignore their severity, trusting the sluggishness of bureaucratic government to minimize the impact of any excesses of thought. As it turns out, the people Mayer interviewed were largely indifferent to anti-Semitism or actually anti-Semitic. The culture shaped them to be so, with frequent political rhetoric designed to show them how unjust the economic systems were and how the Jews had taken advantage of the rest of the population. Eventually people started to believe that, so that when the synagogue was torched it did not seem to great a travesty and when the local policeman was given the order to collect his neighbor for relocation and forfeit of his property, it seemed simply logical given. The program of anti-Semitic action was introduced slowly and incrementally so the German people had little sense of outrage at the next “little” encroachment on the lives of their Jewish neighbors, though all the while the kettle was getting hotter. You will understand me when I say that my Middle High German was my life. It was all I cared about. I was a scholar, a specialist. Then, suddenly, I was plunged into all the new activity, as the university was drawn into the new situation; meetings, conferences, interviews, ceremonies, and, above all, papers to be filled out, reports, bibliographies, lists, questionnaires. And on top of that were the demands in the community, the things in which one had to, was ‘expected to’ participate that had not been there or had not been important before. It was all rigmarole, of course, but it consumed all one’s energies, coming on top of the work one really wanted to do. You can see how easy it was, then, not to think about fundamental things. One had no time. Though the Third Reich replaced Christian belief with a pagan-infused religion with Christian trappings, the religiously devout were led to abandon their faith for German unity. Though their neighbors were displaced and abused, they assented or failed to resist. The intelligentsia and the common man were played by Hitler and his administration—made ineffective—and they allowed it to happen. This book is powerful. Not primarily because I believe the present administration to be equivalent to Hitler’s, but the social climate seems to be laying the groundwork for a similar horrible power in the U.S. or even in Europe. We are not to the stage of Germany in the 1920’s, but it is as if we are being groomed for that condition. Our call should be to resist. Not merely to resist the politics of the “other side,” whichever side that might be, but to resist the moral formation that will enable us to countenance the grave, overt, and unforgivable injustices that the Nazis were able to perpetuate. This may require us to put down our phones, read fewer blogs, and contemplate more fundamental things, like hope, love, truth, and faith.